Thousands turned out for a fantastic evening at Warwick Town Bonfire on November 4th, settling into a new home at Warwick Racecourse. The skies were clear and cold and visitors got a great view of the show from the grandstands. 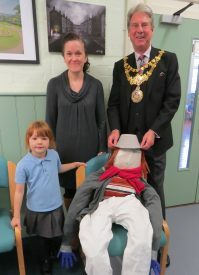 There was a carnival atmosphere as a steel band played and a brisk trade was soon underway with sales of hot food and drink, litesticks and mulled wine. The racecourse bar was busy, little children enjoyed the rides, and the Guys made by the youngsters at Newburgh & Westgate school added to the atmosphere. The children’s fireworks at 6pm really got the party started and at 6.30 Cllr Stephen Cross, Mayor of Warwick accompanied by the Presidents of Rotary and Lions, who organised the show, welcomed the crowds and counted down as the Bonfire was lit. The firework show was then delayed as spectators on the common had to be moved back, but eventually got under way set to music with massive bangs and colourful displays. John Taylor, Chair of the Bonfire Committee said “we are delighted how well the event has settled into the racecourse and to be able to continue the tradition of a Town Bonfire. We are most grateful for the support of the Jockey Club and Warwick racecourse, it’s been a really great night”. Proceeds are distributed to local charities and good causes by the organising clubs. The committee would also like to acknowledge the support of Baxi Heating, Bovis Homes, Unipart, Leycester House Care Home, and Hilton Hotel, as well as all the local retailers who helped with the sale of advance tickets. 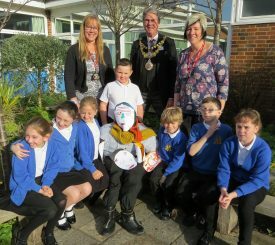 Warwick Mayor Cllr Stephen Cross, visited both Newburgh and Westgate Primary Schools to see the Guys made by the children and hear about the Gunpowder Plot.